What? Clean my flute, you say? How do I do that? Don’t worry, what seems foreign now will soon become second nature. Cleaning your flute should be a part of your daily routine. You’ve probably heard that you should clean your flute on a regular basis, but regular isn’t that specific. That could mean monthly, weekly, daily, or even hourly. Regardless of how you define regular, you definitely need to keep your flute clean. There are many reasons why you should clean your flute. 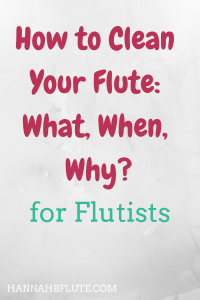 Why should you clean your flute? The main reason you should clean your flute is to swab out excess moisture. Removing fingerprints and dust is why you should clean the outside of your flute. Swabbing the inside of your flute can also help you avoid sticky pads. Sticky pads usually occur because condensation in your flute works its way to your keys. So swabbing your flute often means you won’t have to deal with the annoying sound of sticky pads. How often should you clean your flute? At the very least, you should clean your flute once a day. Minimum. If you play your flute a lot (like in music school), then you should swab it out multiple times a day. Some flute repair techs might say you should swab as often as every 20 minutes. A good rule of thumb is that if you see or feel spit or condensation fall out of your flute, it’s time to swab. It all depends on how much you play your flute. If you don’t want to disassemble your flute, there are products you can buy that have a full length rod. They usually have a bit of fabric on one end so you can swab out your flute quickly. I have one for my piccolo, and (aside from earplugs) it’s my favorite piccolo accessory. Should you take your flute to the shop? While daily maintenance is important, you should also take your flute to a technician. If you don’t play very much, once a year should be fine. However, if you play a lot, you should aim for every 6 to 12 months. If that seems often, think of your flute like your car. You have to get the oil changed every so often. A flute also needs some more advanced maintenance that most players can’t do on their own. The typical work a flute tech will do is called a Clean-Oil-Adjust (or COA). A COA might involve removing the keys to give your flute a chemical bath. It can include oiling the keys and making sure everything is set for you to play. Pro tip: if you’re starting to get frustrated with your flute, it might be time for a trip to the shop. Sometimes, a COA is all that your flute needs. When it comes to daily flute maintenance, it’s actually pretty simple. I’m not going to go into what happens in the shop. But taking good care of your flute on your own means fewer trips to the shop and more time with your flute. If you know how to clean your flute, you can save money on unnecessary repairs. And you can maintain the value of it should you upgrade and sell it later on. To clean the inside of your flute, you need a cleaning rod and a swabbing cloth. Make sure you choose a wooden or plastic rod, because a metal rod can scratch the inside of your flute. For the swabbing cloth, you can choose one made of silk, cotton, or even bamboo. I currently use a bamboo swabbing cloth from Beaumont Music, and I love it. Oh, and I use the cleaning rod that came with my flute. For the outside of your flute, you’ll need a polishing cloth. Like swabs, polishing cloths come in different materials like cotton or microfiber. If you have sweaty hands and/or acidic sweat, you should also get a Blitz cloth. A Blitz cloth has two sides one of which is for buffing silver and the other for polishing it. Note: if you have a gold or gold plated flute, you can skip this. There are so many flute cleaning tools out there, and a lot of them either are for technicians only, or they just don’t work at all. Unless you’re a technician, DO NOT get any sort of liquid to clean your flute. If liquid gets near the pads, the pads can deteriorate. Flute techs have certain liquids they use on your flute, but they know how to use them properly. Another thing you should avoid is the flute snake. Flute snakes look like big pipe cleaners, but for your flute. A lot of students get sucked into buying a using one because of the different colors you can choose from. However, the fluff on a flute snake can come off and get into your flute and then your keys. The flute snake seems like an amazing tool, but it can do more harm than good. Once you have the right materials, it’s time to swab your flute. Grab your cleaning rod and flute swab. The rod should have a hole on one end. Take your swab and “thread” one corner of the cloth through the hole on your rod. Now cover the rod with your swab. Pick up one part of your flute (disassembled) and run the rod/swab combo through your flute. I usually start with the footjoint, then the body, and end with the headjoint. The last thing you want is to run a soaked swab through a relatively dry section of your flute. Some people push the rod through the body or the footjoint, and others will stick it in one end, pull it back out, and swab the other side. I usually push the rod through, except for the headjoint. When you first got your flute, it was probably pretty shiny. It is metal, of course. While wiping your flute isn’t absolutely necessary, it’s an easy way to keep your flute looking good. If you have acidic sweat, wiping down your flute is necessary, because the acid could wear down parts of your flute like the mechanism or plating. Also, wiping down the joints where you flute connects will keep you from struggling to assemble or disassemble your flute. Dirty joints can make it hard to put your flute together or take apart. Are you overwhelmed yet? Well, don’t be! Flute care can be scary, but it only takes a few minutes. You can save the really scary part for your flute technician. For more on what I use to keep my flute clean, check out this post on my flute bag necessities! Next Next post: Classical Music Myths: Busted!